A small amount of moss; you may have some growing in your garden or in a field close by. To moss the frame, make up small bundles of moss in your hands and using your mossing wire or a roll of twine, wrap the twine around the moss securing it tightly onto the wire ring. Continue around the ring until it is completely covered in moss and to secure it again, go back around and wrap the moss with the twine or wire once more. Once the moss ring is complete, you can begin adding the spruce and holly using the same wrapping technique. Make little bundles of spruce and holly and place them at an angle to your moss frame. Begin wrapping with the twine, each time laying one bundle on top of the other until the entire ring is covered with spruce and holly. Once you have added the spruce and holly around the full circle of the ring you should be left with a small gap. This is meant to be there as it’s where you will tie a bow at a later stage. 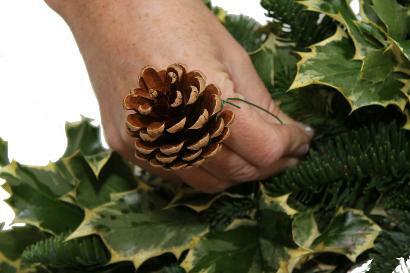 TIP: To make the wreath larger, use longer pieces of holly and spruce and angle them outwards as far as possible. 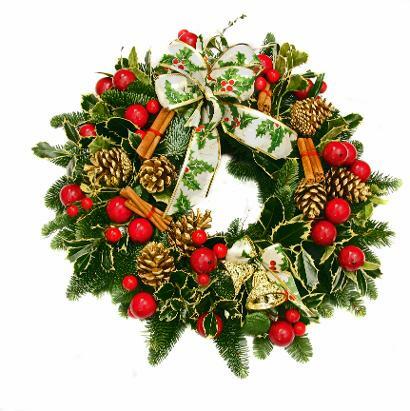 Tie your bow onto your wreath where you have a gap from where the spruce and holly joined. Cones can be wired by wrapping the wire around the petals and twisting together, baubles can be wired through their hook and fruit slices can be wired through the fleshy part. You can use anything at all to decorate your festive wreath – nowadays lots of people like to match their door wreath to their interior decor. 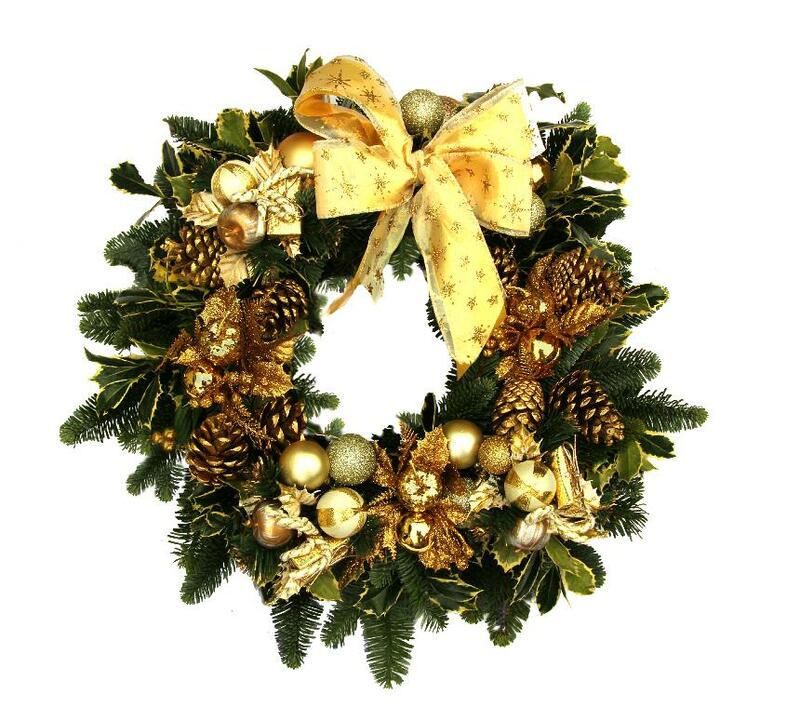 Traditionally pine cones, baubles, fruit slices, cinnamon sticks, etc., are wired and used to decorate your wreath but you can choose anything you like at this stage and wire or glue it onto your wreath frame. TIP: Most department stores have a huge selection of fabric ribbons for making bows. On the Kay’s Flower School website, we have some videos on making different bows for different occasions. Christmas Pics can also be bought and inserted in to decorate to your taste.